Kejora Villas-Suites is a beachfront luxury villa complex located in Sanur on the east coast of Bali approximately 20 minutes from the airport via the toll road . 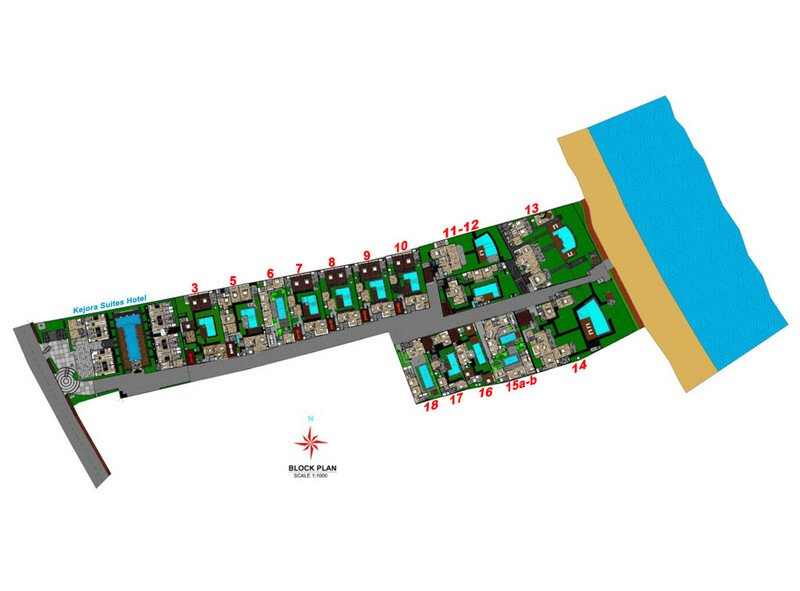 The villas are situated in the most desirable location on beachfront land with its own private beach access and the main street at the entrance of the complex offering spas, salons, supermarkets, world class restaurants and boutiques. Kejora Villas opened it doors late in 2011 offering private luxury accommodation attracting visitors from all around the world. The villas and suites offer the very best in luxurious holiday accommodation with every room a reflection of the Balinese environment. The style and architecture of the villas is a fusion of Balinese architecture and modern design. Kejora Villas-Suites attract clients from all around the world seeking an unforgettable holiday experience whilst in Bali. Arguably the best location in Sanur, Kejora Villas-Suites offers the optimum in luxury, tranquility and premium quality villas in Bali. Your holiday experience will be one which will remain with you forever. From our executive absolute beachfront villa you can enjoy uninterrupted ocean views from your poolside and dining areas. This large villa of 1400 sq. meters is ideal for small weddings, family gatherings and special occasions. Catering can be arranged for that special event and the four bedroom total luxury villa accommodates 8 persons. Truly an experience for the discerning holiday guests. Each Kejora Villa has it’s own private swimming pool with outdoor bale/gazebo area to enjoy that afternoon cocktail or simply laze in the sun. The mild temperate climate makes the outdoor areas very popular to just enjoy the freedom of being outdoors. Bedrooms are total luxury with exquisite fine cotton linen on all the beds, white fluffy towels and pool towels all provided. Outdoor rain showers in each villa will have you bathing under the sun and the stars. Lush tropical gardens surround the outdoor areas of each villa. Fully equipped,modern, designer kitchens allow you to dine in or alternatively take advantage of the many beachside restaurants right at your front door. Living and dining areas are large with cable TV and free wi.fi in each villa. All living areas and bedrooms are air conditioned for your comfort. English speaking staff are on hand to help you with organising your trips, dining tips, shopping secrets etc. The villas and suites offer 24 hour security at the main entrance and beach entrance. Enjoy the location right on the beachfront and stroll the 8km stretch or hire a bicycle for your morning’s outing. Housekeeping will come through each morning and clean and refresh your villa. The Glass House restaurant is on the same property as Kejora and offers quality dining room service to the villas. Call the restaurant for either a complete lunch or dinner selection or just simply some cocktails for around your pool! Staff at Kejora Villas- Suites are dedicated to making your holiday a memorable one and the mixture of the friendly Balinese and Australian staff are always available to take care of day to day requirements, guest relations and planning of trips and tours if required. Our goal at Kejora Villas-Suites is to deliver outstanding customer service so that you will enjoy your stay while making memories of a lifetime and of course to encourage your return to Kejora. We are also thrilled to offer our boutique hotel Kejora Suites as a luxury suite separate to the villas. Situated at the front of the Kejora complex the Suites offer the premium traveller a luxury suite consisting of 45sq.m room with fully equipped Balinese bar and adjacent to a sleek , modern bathroom encompassing an outdoor lush garden as you bathe. The Suites are ideal for travellers requiring just a room and not a whole villa. The designer pool and lush surrounding gardens provide a haven from the hustle and bustle of daily life. You are enconsed in a quiet luxurious hotel with all modern facilities provided. We invite you to book your holiday with Kejora Villas-Suites and let us take care of all your holiday needs as you enjoy our beautiful, tropical resort and the village of Sanur on the Island of the Gods.